“One month from opening, officials at Hoffman-Madison Waterfront (HMW), the master developer of the $2.5 billion, world class, mixed-use waterfront neighborhood The Wharf, announces opening day headliner The Bacon Brothers and more than 50 bands and performers that will help the city celebrate The Wharf’s Kickoff Celebration which begins Thursday, October 12 and runs through late Spring 2018 (with the opening of the restored and expanded 200-year-old Municipal Fish Market). The Wharf’s Kickoff Celebration begins with a waterfront ceremony on the morning of Thursday, October 12 on District Pier. The ceremony will be followed by a full day of live music and entertainment that culminates in a headliner happy hour concert by The Bacon Brothers, the “forosoco – folk rock soul country” band made up of award-winning actor and singer Kevin Bacon and his brother, Michael. The Bacon Brothers Concert and all outdoor waterfront activities are free to the public. Through Sunday, The Wharf’s Kickoff Weekend will feature more than 30 renowned bands and musical performers from around the DC region including Howard Gospel Choir of Howard University, Batala Washington, Gay Men’s Chorus of Washington, White Ford Bronco, GoGo Gadjet, Pebble to Pearl, Oh He Dead, Aztec Sun, Wil Gravatt Band, Children’s Chorus of Washington, Jimi Smooth and HitTime and more. In addition to the musical performers, the weekend’s celebrations will include more than 20 buskers and performers including stilt walkers, face painters, muralists, magicians and The Wharf’s signature waterfront fireworks. 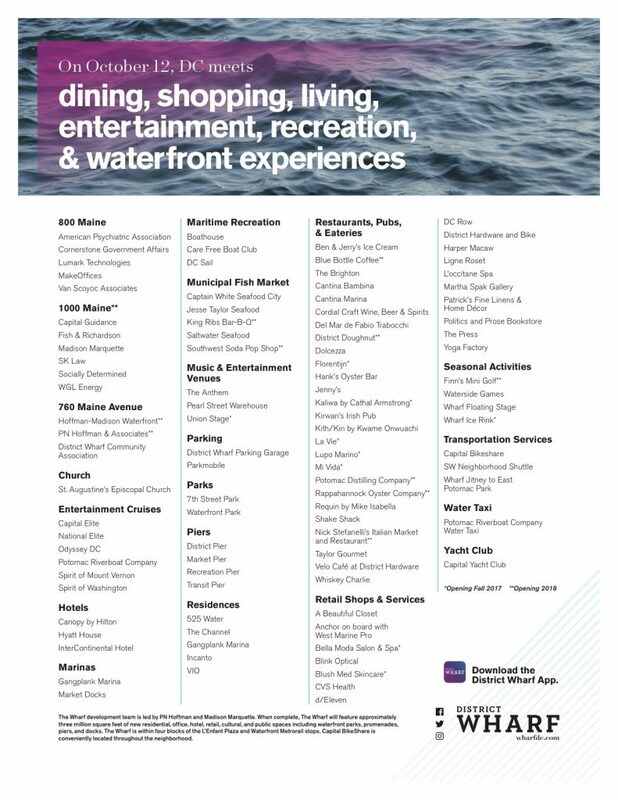 Starting on October 12, those visiting and living at The Wharf will be able to enjoy numerous restaurants ranging from casual eateries to elegant dining on the waterfront, including Del Mar by Fabio Trabocchi, Requin by Mike Isabella and Hank’s Oyster Bar by Jamie Leeds. Music venues include The Anthem, Pearl Street Warehouse and Union Stage. 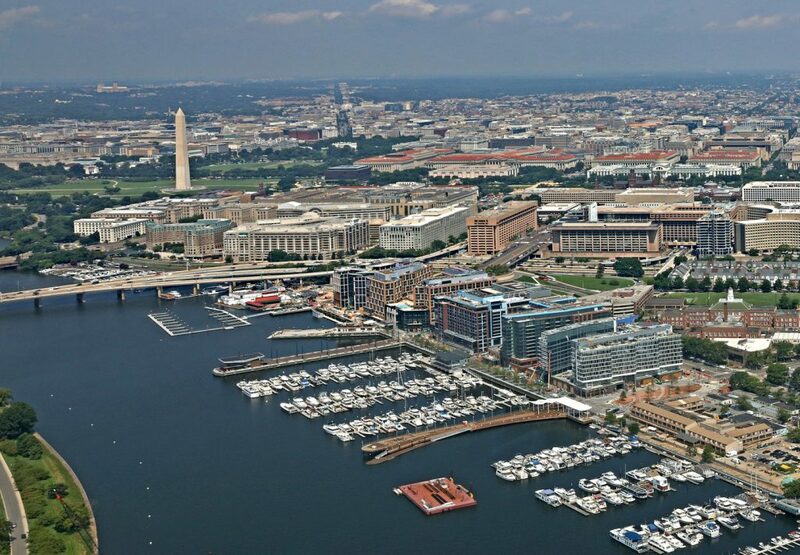 Visitors will also be among the first to benefit from the various new methods of transportation options surrounding The Wharf including the free Southwest Shuttle, with stops at The Wharf, National Mall and L’Enfant Plaza; the free Wharf Jitney that will ferry people from The Wharf to East Potomac Park and back; and a regional water taxi operated by the Potomac Riverboat Company. A full list of expected October 12 openings and a Kickoff Celebration calendar of events is attached.